It’s no secret that I absolutely adore bacon. When you sleep and dream about your vacation, I dream of a bacon vacation where I get to devise delectable baconventions. 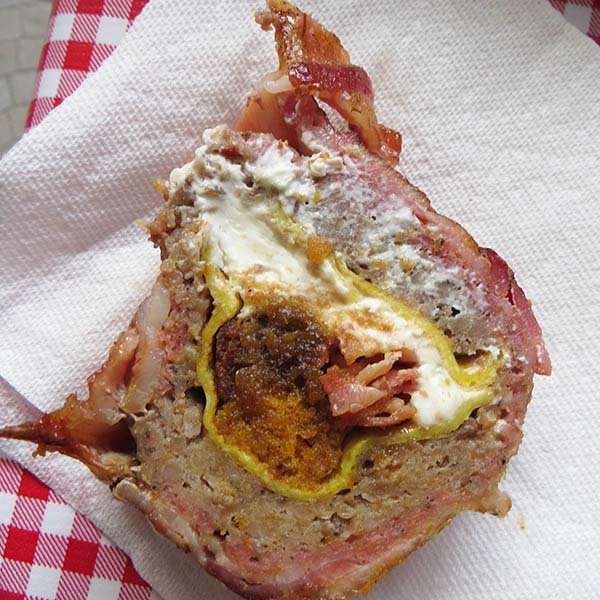 In my prior recipe blogs, I’ve put in it in my pineapple mozzarella rings, apple pie, meatloaf, breakfast fatty, buffalo turds, pig candy, and even bacon weave animals . 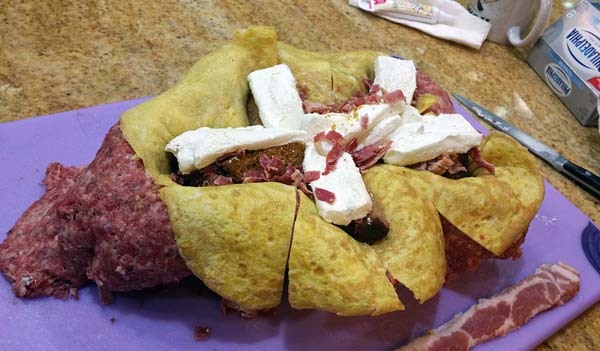 One of the time-honored traditions at barbecue contents is to make a breakfast fatty for your crew. 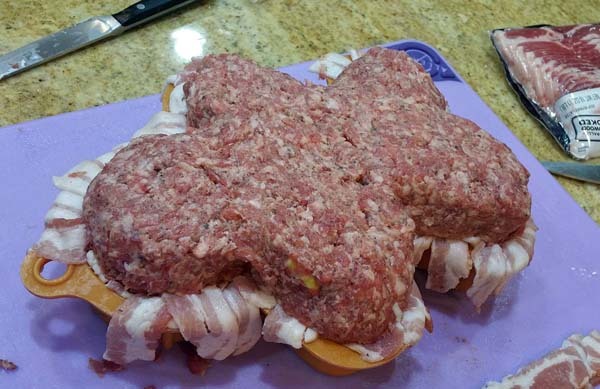 Fatties are usually made of sausage meat stuffed with your favorite things like crumbled bacon, scrambled eggs, and potatoes. 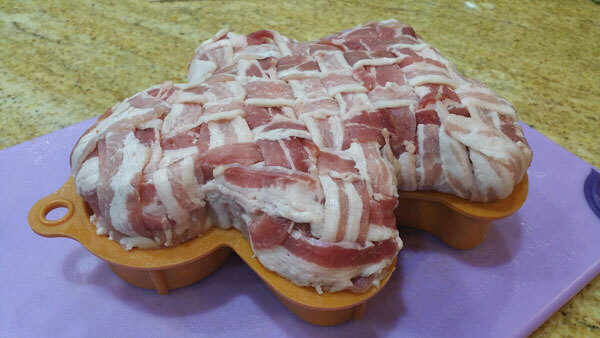 I like to make my fatties covered with a bacon weave to give it an extra special touch. 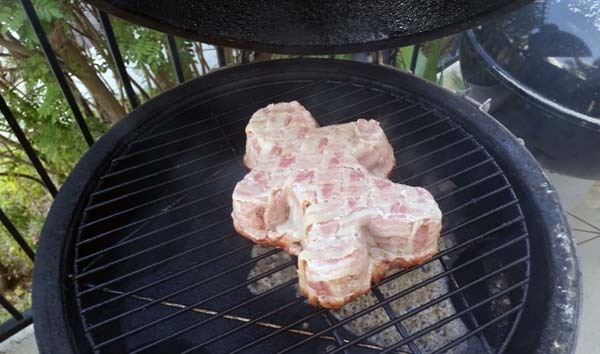 The bacon weave always bring a smile to anyone who tries it. 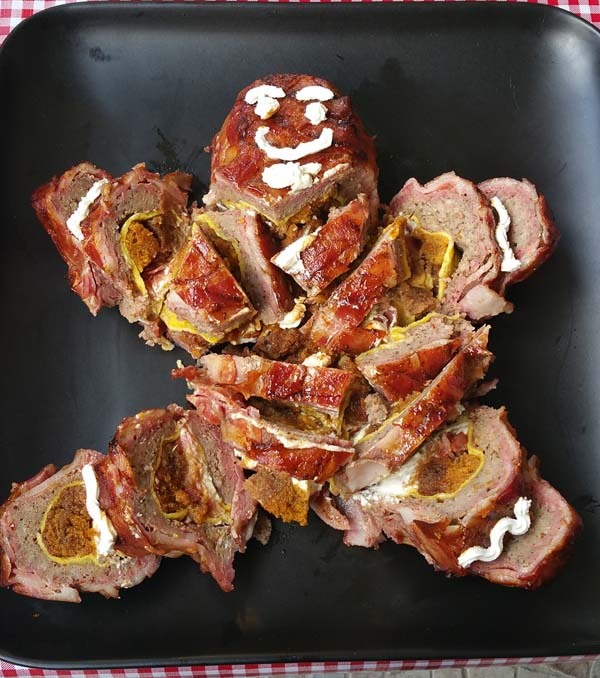 For the holiday season, why not treat your guests to a breakfast fatty in the shape of a gingerbread man. 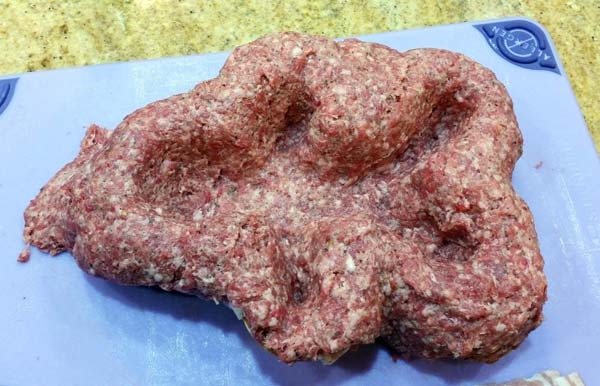 I found a silicone baking mold used to bake a 10-inch tall gingerbread man and decided to use the mold to shape the fatty. 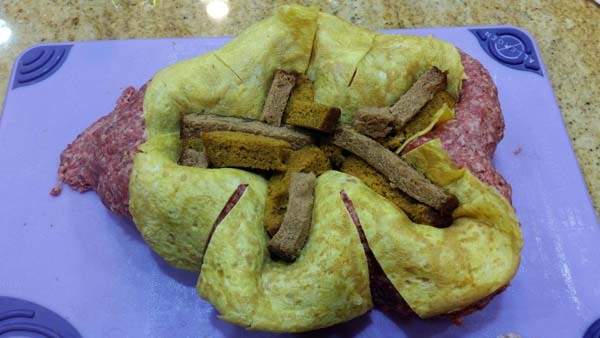 Since it was Christmas, I added some slices of pumpkin loaf, ginger loaf, cream cheese, egg omelet, and crumbled bacon. 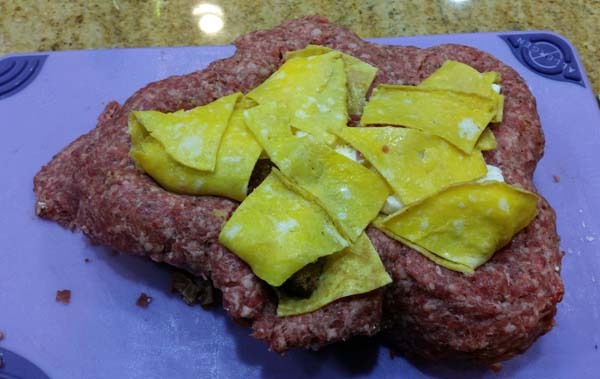 You don't really have to follow every step of my recipe so feel free to experiment with this fatty idea. 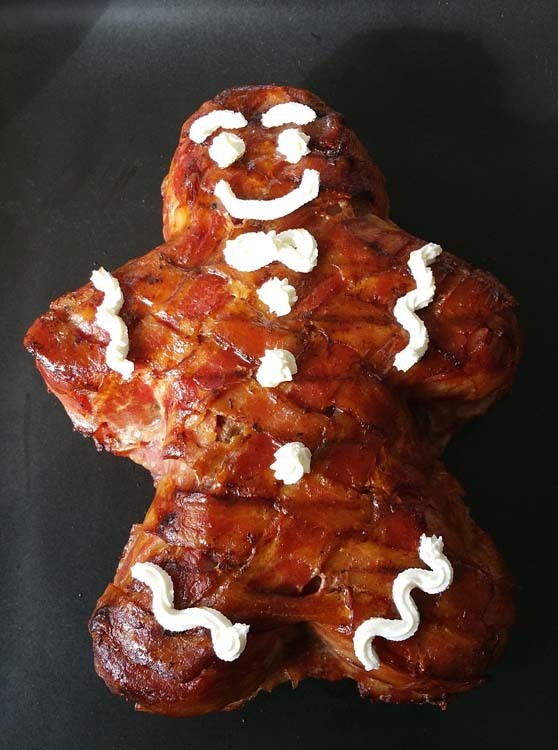 Create a bacon weave and line the silicone gingerbread man mold. 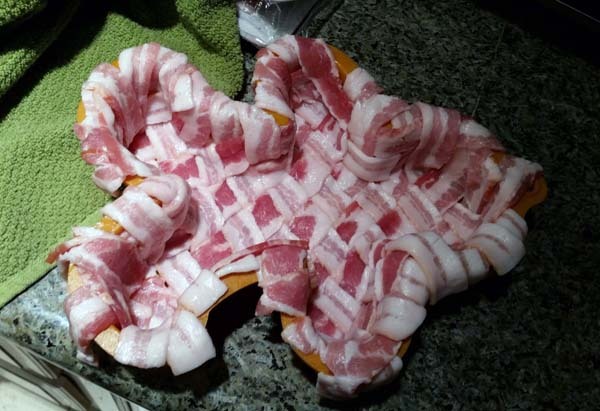 I cut the bacon slice into half lengthwise to make for a finer weave. Brush on your favorite barbecue sauce and decorate the eyes, nose, mouth, body, arms, and legs. Cut and serve warm with some BBQ sauce on the side. Love it! So cute 🙂 Poor thang!